Apple CEO Tim Cook confirmed in 2017 that the company’s secretive driverless car project, codenamed Project Titan, would focus, at least at the time, on creating the autonomous AI that powers self-driving cars. Apple's self-driving car project has grown since then, with the company expanding its fleet to 55 test cars, up from the three it started with last year. And, just yesterday, we filmed an unmarked Apple self-driving car in Sunnyvale, California, complete with a new-look array of lidar sensors and cameras. In another new turn in the ongoing Apple self-driving saga, the New York Times reports that Apple has partnered with Volkswagen to develop self-driving shuttle buses that will exclusively drive employees between its two Silicon Valley campuses. Apple hasn't confirmed this news, refusing to comment. But, according to sources for the New York Times, the project is the primary focus of the Apple car team, though it has fallen well-behind schedule. VW allegedly wasn’t Apple’s first choice. Over the past two years, Apple may have courted BMW, Mercedes-Benz, Nissan, Chinese automaker BYD Auto and British automaker McClaren for a large-scale partnership. Most of these proposed partnerships fell apart because Apple alleged wanted internal car design schematics and access to driving data from partners, Times sources said. Apple’s first choice, BMW, may have chosen to make its own self-driving cars rather than play second fiddle to Apple. Eventually, hoping to move past its 2016 emissions-cheating scandal, VW accepted the Apple partnership, donating T6 Transporter vans and allowing Apple access to its data, sources at Apple say. Apple and VW have allegedly been working on the joint electric, self-driving T6 van prototype in Turin, Italy. Sources claim the model uses the frame, chassis and wheels of the standard VW design, but that Apple is swapping out the dashboard, seats and electric car battery, and adding the lidar sensor rig we’ve already seen. The van would be self-driving, not driverless, and require a two-person team—a safety driver and monitoring operator—at all times. The T6 team reportedly promised a 2018 deadline to Cook that already passed, and beyond this project the driverless car team apparently has no realistic commercial goals for the next few years that could make Apple any money. This could put Apple well behind its rival, Google, whose Waymo subsidiary plans to launch a self-driving ride-sharing service in Arizona later this year. Earlier this year, we spotted an Apple patent for a VR system built specifically for its self-driving cars. Riders inside of windowless, driverless cars would sit on active, rotating seats that would prevent motion sickness. Passengers could even swivel to let them see their virtual surroundings through the car’s cameras. It turns out that this patent came from a more optimistic period of Apple’s self-driving work. Jonathan Ive was appointed Chief Design Officer in 2015, and was assigned to come up with ambitious self-driving car designs that year. The Times report says that his team brainstormed everything from AR holographic displays in the windshield to heat-reducing polymer sunroofs. Another plan was to develop a layout with four seats facing each other, similar to a design Mercedes came up with. Until 2016, sources claim, Apple planned to manufacture its own car in-house. Eventually, the team ostensibly understood that designing a car from scratch wasn’t their area of expertise, and began looking for partners. As one partnership after the other failed and in-house driverless plans stalled, hundreds of team members slowly began to leave, or were let go from, the self-driving division. 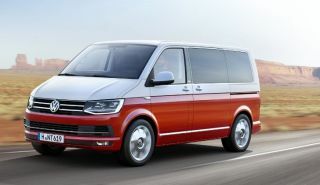 Now, VW may have partnered with Apple, but it’s unclear whether Apple will enlist its help with projects after the T6 is finished, especially since it has run behind schedule. And, so, unless you work for Apple, you probably won’t get a chance to ride in the company's self-driving cars anytime soon.